Paying off loans, of any kind can seem extremely difficult. You may not have calculated how drastically the interest would impact you and you may have missed out on a better deal because of that fact. 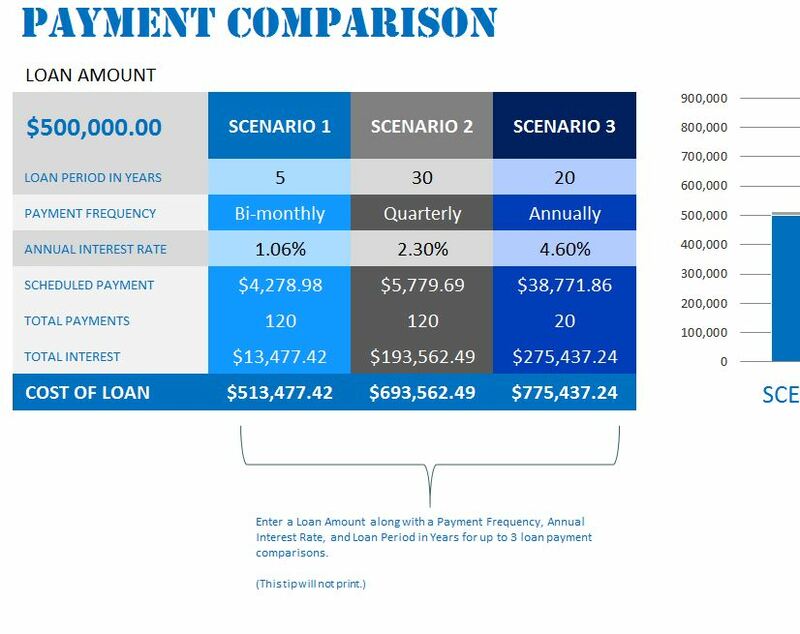 The Loan Payment Template is a tool to help you analyze three different loan options and see which path is the best. The template will serve as your personal guide to making better financial decisions. It doesn’t matter if you set out to buy a home, a car, or even set a plan for your student loans, this template uses simple formulas to calculate how much you’ll be paying over time so you’ll see the real price tag. You can learn more about this tool by reading the instructions below. When you first download the free Loan Payment Template you will notice three different tabs at the bottom of your screen. Start in the “Payment Comparison” tab and enter the details for up to three different loan types in the “Scenario” sections. The first column of this template displays exactly what you need to enter in order to receive your information. Feel free to play around with the different options in each section, as they apply to your loan. You’ll use the drop-down menus to select different payment schedule type (monthly, bi-monthly, weekly, etc.). The template will take your different scenarios and give you a graph that illustrates the amount you pay in blue and the interest you accrue in gray. You will also use the “Payment Schedule” tab to see each of your payments each week, month, or every other month. The “Loan Calculator Data” tab tells you how many payments you’ll end up making by the end of your payment period. You can finally have the foresight to see exactly how much you’re spending, instead of taking the salesman’s word for it.